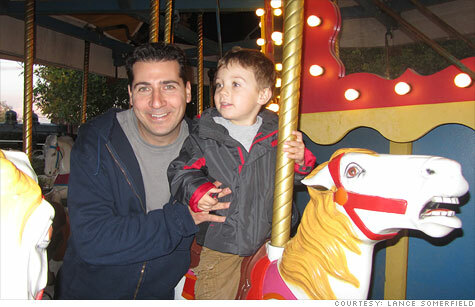 Lance Somerfeld is one of a growing number of stay-at-home dads. NEW YORK (CNNMoney) -- Before Jessica and Lance Somerfeld had their baby, they decided it would make the most financial sense for one of them to stay home to raise him. Since Lance made a fraction of Jessica's earnings, he was the obvious choice. With wages at a standstill and child care costs skyrocketing, Somerfeld is just one of a growing number of dads who are staying home with the kids. Among fathers with a wife in the workforce, 32% took care of their kids at least one day a week in 2010, according to the U.S. Census Bureau, which looked at families with children under 15 years old. That's up from 26% in 2002. Of those with kids under the age of 5, 20% of dads in 2010 were the primary caretaker. Not only has it become more necessary for men to pitch in at home, but fathers have also become more available to do so. "It's a combination of mothers going to work and fathers being out of work as a result of the recession," said Lynda Laughlin, a family demographer at the Census Bureau. Men were particularly hard hit by the steep job losses during that time, losing 4 million jobs since 2007, while women lost just over 2 million during the same time period, according to the Bureau of Labor Statistics. While men have since gained back a majority of those jobs during the recovery, their unemployment rate -- at 8.3% in March -- is still above the national average of 8.2%. Many find that having one parent at home does have its advantages, especially as child care costs continue to climb. Couples do the math and realize that it makes more financial sense for one spouse to stay home with the kids. And while it's often the woman who decides to drop out of the workforce, more men are taking on the responsibility of child care as well. A lot of that has to do with who makes the most money in the household. Even though the wage gap between the sexes persist, a growing number of women are out-earning their husbands. In 2008, 26% of women living in dual-income households had annual earnings that were at least 10 percentage points higher than their spouse, up from 15% in 1997, according to the Families and Work Institute's latest data. As a New York City school teacher, Somerfeld said he made a fraction of his wife's salary. "She was probably making 80% of our household income and I was 20%," he said. Her career as a corporate actuary for an insurance company "was on a really good track and it made more sense for me to stay home." But the decision they made wasn't strictly a financial one. "Too often, we hear that it's the economy that forces dads into these roles and that's certainly a part of it, but I would love to shatter that stereotype," Somerfeld said. "Being my son's primary caregiver is something I have truly cherished and embraced and never looked back." Three years ago, Somerfeld started the NYC Dads group to connect with other fathers in a similar position. The group now has over 550 members. Should I stay home or work after the baby's born? "There are a lot of guys out there that had remote relationships with their own fathers and they don't want that with their kids," added Jeremy Adam Smith, a one-time stay-at-home dad and author of The Daddy Shift. "It's not just stay-at-home dads -- fathers in general are participating more in their children's lives." Regardless of their employment status, nearly half of the men surveyed by Families and Work Institute said they take most or an equal share of child care responsibilities, up from 41% 20 years ago. Just don't call them "Mr. Moms," said Ellen Galinsky, president and co-founder of the Families and Work Institute. "Like it's a female task, I've never understood that." Correction: An earlier version of this article incorrectly stated the unemployment rate among men as 8.9%. The seasonably adjusted rate is 8.3%. Giving up on the job hunt: Are you unemployed, and you've stopped looking for a job? Email realstories@cnnmoney.comwith your contact information and you could be featured in an upcoming article on CNNMoney. Have kids become too expensive?